Many entrepreneurs have found success in crowdfunding. But one expert said it’s not as easy as some people think. Kickstarter is an all-or-nothing funding tool—if businesses don’t raise enough money in the allotted time frame, donors get their money back. About 44 percent of projects get funded, according to the Kickstarter website. Iffert-Saleem, who teaches classes on crowdfunding campaigns, said marketing is a big challenge. She recommends people plan their campaigns at least six months in advance and to keep the campaign and project description concise. She said shorter campaigns with fundraising goals under $10,000 typically do better. “When you aim low, you have better chances of being successful,” she said. Crowdfunding not only can help launch a business, but it can help save a business, too. Several Phoenix businesses have turned to sites such as Kickstarter and GoFundMe, which ask community members for contributions, to help the shops stay afloat. Audrey Iffert-Saleem, executive director of entrepreneurship and innovation initiatives at Arizona State University, teaches classes on crowdfunding campaigns. Iffert said it’s becoming an increasingly acceptable way to get ideas off the ground. “If you look at trends, Kickstarter and Indiegogo are just the tip of the iceberg,” she said. Independent small businesses often turn to crowdfunding because they don’t have investors and additional funds if unexpected expenses come along. Two Phoenix businesses have found success with crowdfunding, and one aims to have the same success. 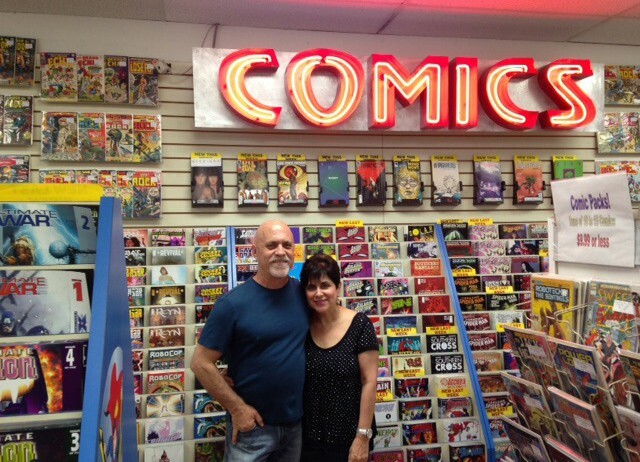 All About Books and Comics, a family-owned comic book shop on Central Avenue and Camelback Road in Phoenix, launched a Kickstarter campaign to relocate. Owner Marsha Giroux said the office next door bought the building to expand – and that meant her store had to move. The store had been at the same location for 33 years. Giroux and her husband, Alan, found a nearby building they could use. But that means creating new signs, moving more than one million comic books, painting, adding drywall, setting up a security system and installing flooring. It will cost between $60,000 and $70,000, Giroux said. Giroux said they looked at bank loans, but they turned to Kickstarter after her son suggested it. Kickstarter allows donors to get something ¬– like comic books, T-shirts and naming rights to a section ¬–in return for a donation. Last week, All About Books and Comics exceeded its goal of $33,000 by more than $4,000, and 538 donors backed the campaign. Mike Stoffey turned to Kickstarter after his shop, Mary Coyle’s Ol’ Fashion Ice Cream, shuttered last October. Stoffey purchased the long-standing ice cream shop in 2011. Although the store made a profit on ice cream sales, the building had too much extra room and cost too much, Stoffey said. 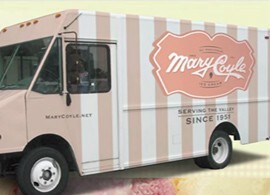 Josh Feig, who works for Air Integrated Marketing, approached Stoffey to launch a Kickstarter campaign to revive Mary Coyle’s Ol’ Fashion Ice Cream in the form of a food truck. Although the mindset and landscape of the city has changed since Mary Coyle’s opened in 1951, the ice cream shop was such a great fit for the Phoenix community, Stoffey said. Stoffey said he wanted to go with a food truck rather than brick and mortar store because of the popularity of food trucks. “I was convinced the truck would allow us to take ice cream to the people rather than them come to the store,” he said. As of Thursday, Stoffey’s campaign raised $2,980 of its $45,000 goal. If Stoffey doesn’t raise enough funding, he plans to reevaluate. “I don’t think by any means it’s the end of Mary Coyle’s in Phoenix, but it will be a challenge to bring it back,” he said. Dana Stern of Bragg’s Factory Diner launched a GoFundMe campaign last year with co-owners Liam Murtagh and Emily Spetrino-Murtagh after repair costs and a slow summer season put the restaurant on the brink of closing. 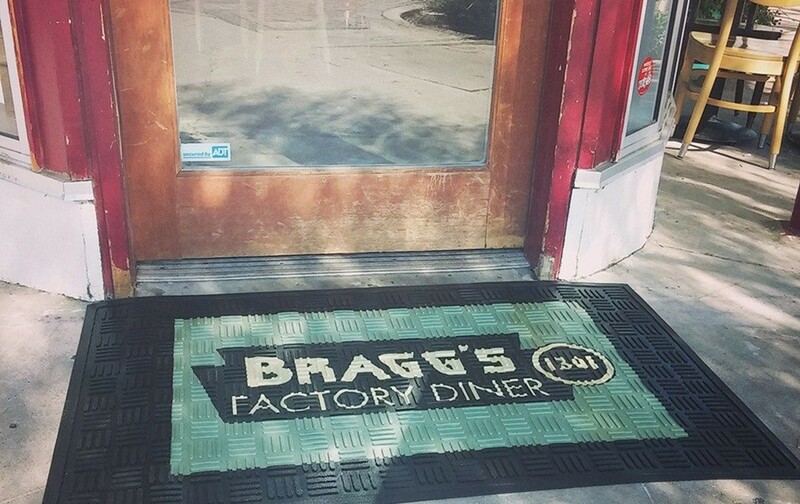 Bragg’s Factory Diner opened two years ago in the Bragg’s Pie Factory building, which is on the National Register of Historic Places. It’s located on Grand Avenue in Phoenix, which is home to several art galleries and small businesses. The diner raised more than $8,000, which covered rent, basic utilities, food and employee wages. The diner actually got a boost from customers who didn’t know the restaurant existed until the campaign, Stern said. Stern said she was overwhelmed by the generosity of patrons, and she definitely sees benefits in crowdfunding. She had some advice to other business owners who want to try it. Stern said the diner is at the point now where they can plan for the future, rather than wondering if they are going to stay open for the week. Phoenix Icon Mary Coyle Ice Cream closed its doors last year. Now it has a chance to make a comeback with the help of loyal customers and a Kickstarter campaign. 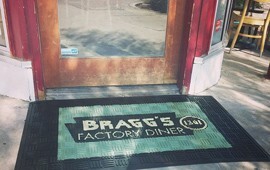 Bragg’s Factory Diner, which opened in 2013, found success with a GoFundMe campaign after unexpected expenses put the restaurant on the brink of closure. 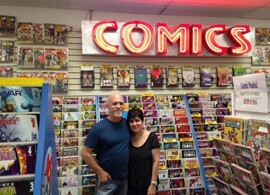 Alan and Marsha Giroux opened All About Books and Comics in 1981. They completed a successful Kickstarter campaign last week to cover the cost of relocating.